The Miracles de Notre-Dame par personnages is a collection of forty verse plays written and produced by the Confraternity of Saint Eloi for the Goldsmith's Guild of Paris in the fourteenth century. The plays cover the period between 1339 and 1382, with gaps for 1354 and 1358-60. The collection survives in a single copy (now preserved in two volumes as Paris, BnF, fr. 819-820), written towards the end of the fourteenth century by a single scribe, and illustrated with a miniature at the beginning of each play. The current volume - the first of a projected three - contains colloquial modern French prose translations of the first sixteen miracle plays, and covers the first two volumes of the nineteenth-century edition. Although the Introduction (by Françoise Paradis, as mentioned on the title page and in the foreword) to the volume is brief, it offers more guidance to the reader than did the original editors, who included a glossary but no introduction whatsoever. In contrast, this volume provides a brief description of the manuscript, the historical context, and background on the confraternity, with references to more detailed studies. Quite rightly, the author devotes most of her attention to the general characteristics of the collection, especially the theatrical aspects of the plays. She discusses the techniques of dramatization, highlighting the differences between narrative and dramatic versions of a plot, stage design, and the role of "spectacular" scenes, such as heavenly processions, violence, and the antics of demons. By distinguishing the fifteen plays with a more-or-less historical setting (either royal or hagiographical) from the remainder (described as timeless), she sketches a typology of the miracles, which is further subdivided on the basis of setting, protagonist or audience. The Introduction ends with a brief discussion of recurring themes in the collection. As presented in the volume, each play is prefaced by a more focused discussion (also by Françoise Paradis) of its narrative sources and analogs, a description of its form (number of verses, inserted lyrics; scenic indications), and an analysis of its structure and themes. This format is flexible enough to allow topics specific to individual plays to be addressed. For example, there are discussions of romance motifs (154-55, Miracle IV; 469-70, Miracle XII), bargaining for salvation (324-6, Miracle VIII), the Cistercian ideal of penitence (365-6, Miracle IX), Purgatory (559-60, Miracle XIV), Childbirth (600, Miracle XV), and Confession (653-4, Miracle XVI). Helpfully, each play is dated. The prose translations of the plays are excellent colloquial renderings of the texts as found in the edition (which provided lists of characters not found in the manuscript), but the twenty-five serventois that follow many of the plays in the manuscript are omitted on the grounds (11) that they are unrelated to dramatic pieces. In their presentation of the plays, Bezançon and Kunstmann have introduced a number of elements not found in the edition or in the manuscript: These include indications (in italics, with references to the verse numbers of the original text) of the sets, and stage directions (in parentheses) describing the actors' actions. In addition, the translators have used Arabic numerals to divide the plays into "acts" and "scenes." This extra material enhances the reader's understanding of the texts, and would even allow the translations to be used as the basis for a theatrical production, as hinted at the end of the Introduction (28). For all its admirable qualities, there are nonetheless a few things that would have improved the volume. The Introduction would have benefitted from the inclusion of a more detailed description of the manuscript, particularly since the commentary volume announced in the edition never appeared. The volume also lacks a bibliography, as the list of references at the end includes only the studies referred to in the Introduction and the discussions of the plays. A list of suggestions for further reading might have guided readers intrigued by the plays. In comparing the volume to the edition and the manuscript, I noted one error: The verse sermon referred to in the Introduction (18) follows the first play in the manuscript (on fol. 13) rather than preceding; it is not related to the first miracle, but to the second. It is edited and translated (84-5) as part of Miracle II. Nevertheless, these are small shortcomings. This volume makes an important contribution to the literature of medieval France. 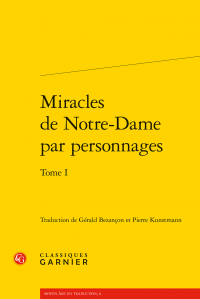 For the first time, the Miracles de Notre Dame are accessible to a broad readership, including those interested in the history of the theater and popular devotion. In addition, there is much to interest scholars of medieval French literature: Although they will not require the translations, they will find much valuable material in the presentation of the texts and in the identification of the theatrical elements of each play.